As summer commences and the 4th of July approaches, it’s important to keep your pets in mind. While 4th of July celebrations are filled with fun and happy times, for some pets, it can be anything but happy. Pet owners whose pets have severe noise anxieties must take caution during the upcoming fireworks season. Unfortunately, this type of phobia may not go away, and if not treated, it can get worse. 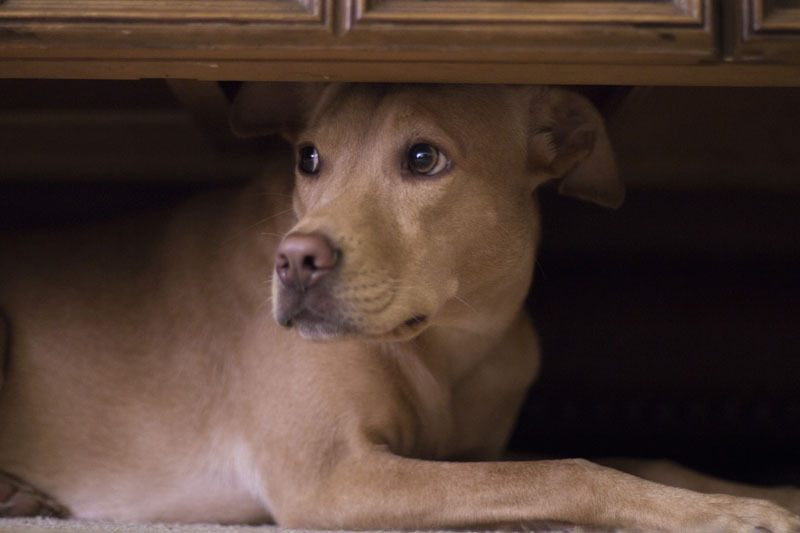 Preparing your furry friend for fireworks, thunderstorms, construction noises, or other anxiety-inducing events is key to helping them feel comfortable and relaxed. ThunderWorks products like the ThunderShirt and ThunderEase are great for soothing your pet when they really need it. It can also help your pet get through thunderstorms, construction noises, vacuums, and other loud noises. The ThunderWorks ThunderShirt almost instantly calms your dog or cat down once it is put on. It works by applying a gentle, calming pressure on your pet’s body, which gives them a secure feeling that helps calm them down. The ThunderShirt is has multiple sizes for both dogs and cats. The ThunderEssence Spray is an aromatherapy that is great for use in combination with the ThunderShirt because it gives that extra measure of calm to ensure a happy pet. The ThunderEase Pheromone Diffuser works wonders for both cats and dogs. When plugged in, it releases pheromones that calm your pet and puts an end to any unwanted anxiety-related behaviors such as destructive chewing and problem barking in dogs and scratching and spraying in cats. Starting Friday, June 1, 2018, through Saturday, June 9, 2018, 1-800-PetMeds will be giving away daily ThunderWorks Prize Packs for both cats and dogs. The ThunderWorks Prize Pack for dogs includes 1 ThunderShirt for Dogs, 1 ThunderEase Pheromone Diffuser for Dogs, 1 ThunderEase Collar for Dogs, and 1 ThunderEssence Spray for Dogs. The ThunderWorks Prize Pack for single-household cats includes 1 ThunderShirt for Cats, 1 ThunderEase Pheromone Diffuser, 1 ThunderEase Pheromone Diffuser Refill, and 1 ThunderEase Spray for Single Cat. For a multi-cat household, The ThunderWorks Prize Pack includes 2 ThunderShirts for Cats, 1 ThunderEase Pheromone Diffuser for Multi-Cat, and 1 ThunderEase Pheromone Diffuser Refill for Multi-Cat. 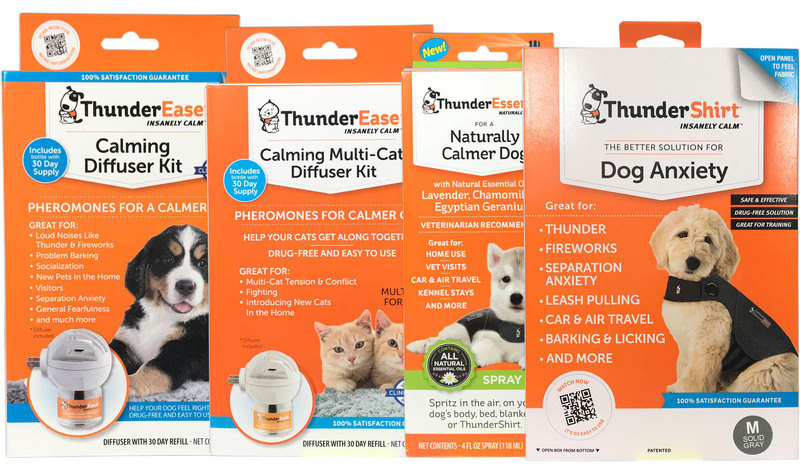 Win a FREE ThunderWorks Prize Pack for your cat or dog! With 4th of July just around the corner, this is the perfect prize pack to help keep your pet calm. Just leave a comment below specifying if you have a dog or cat and your pet’s weight, and you could win a FREE ThunderWorks Prize Pack from 1800PetMeds! One winner will be chosen at random each business day from Friday, June 1, 2018, through Saturday, June 9, 2018, so everyone who participates has a chance to win! There will be a total of nine (9) winners. (Limited to residents of the U.S.) Good luck! Ivy is a Keeshond weighing 37 pounds. Major anxiety from storms and now even sounds in TV. I have a female bulldog Piper and she is 70 lbs. I have a 17 lb cat who has recently moved in with new cats and is being very hostile. My pup is 12lbs. She is petrified of loud noises. Big Papa is an 80 pound dog who thinks he is 8lbs and is the biggest baby I have ever known in my whole life!!!! I have a 11 pound dog who doesn’t like to be home alone. Jeter is 14lb Havanese. Shakes & hides when he hears thunder, fireworks or loud noises! I have a yorkie named Gunner, he is 10 lbs. this would be such an awesome package seeing as my hubby is a fireworks fanatic! I have a chihuahua he weights 9 lbs. Hates any loud noises. especially around the 4th of July…he will stay in my room the whole time.